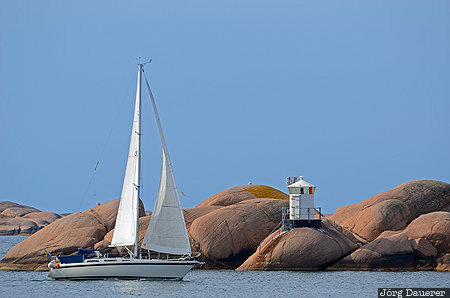 The typical rocky skerry coast near Lysekil with the small Stångholmen Lighthouse and a single sailing boat below a blue sky. Lysekil is in Västra Götaland in the south west of Sweden. This photo was taken at noon on a sunny day in September of 2014. This photo was taken with a digital camera.